As the war against the CIA heats up, masked intruders (likely belonging to the Central Intelligence Agency) broke into WikiLeaks’ head legal council law office, EL PAÍS reported. A total of three people dressed in all black in hoodies entered the law office of former judge and WikiLeaks’ chief council, Baltasar Garzón. The alleged thieves were “very professional” according to police sources; they blinded the security cameras with tape and didn’t steal anything from the offices. Apparently, they have not taken any money, because there wasn’t any on the premise, the publication went on to state. However, according to a rough translation of the report, they scrummaged between documents, although it has not yet been determined what is missing. The investigation is being carried out by the scientific police as if it were “an attempted robbery,” they added. They are waiting for technicians to check if copies of files have been made from the computers. Since he was removed from the judiciary, after being sentenced to 11 years of disqualification for ordering recordings – supposedly illegal at that time – between defendants of the Gürtel plot and his lawyers, Baltasar Garzón has directed, among other things, the legal defense of the founder Wikileaks, Julian Assange. . . .WikiLeaks and Julian Assange tweeted out the report today, expressing concern that the CIA was responsible for the break-in. Notably, WikiLeaks has faced a number of suspicious circumstances happening to its organization; so much so they have released ominous tweets highlighting that none of the organization’s employees or volunteers have any psychological health problems or drug problems that could lead to sudden death. 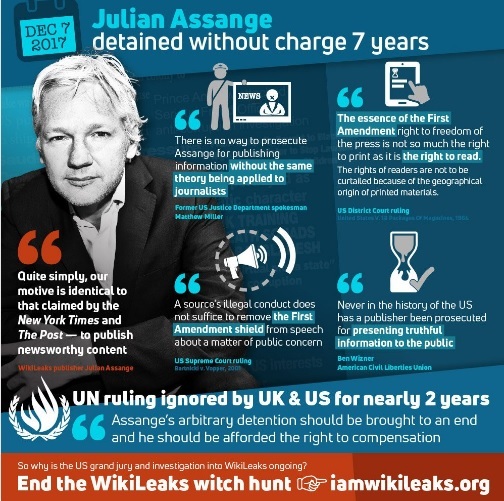 Not to mention that WikiLeaks – the recently recognized institution of journalism by UK tribunal – had an incident last year where someone tried to break into the embassy where its founder Julian Assange has been held for the past 5 years held illegally. Additionally, last year, the international whistleblower outfit had to deal with the death of Gavin MacFadyen, a close friend and confidant to Julian Assange who died of lung cancer, according to a statement posted at The Center for Investigative Journalism (CIJ) which MacFadyen founded in 2003. WikiLeaks is also facing a second blockade with its U.S. tax deductibility being threatened after its Vault 7 and Vault 8 disclosures exposing the CIA’s spying and hacking techniques. Assange has recommended WikiLeaks supporters to use cryptocurrency to donate to the organization in order to circumvent the blockcade. WikiLeaks itself was an early cryptocurrency advocate, first starting to accept cryptocurrency donations in 2011, after a banking blockade attempted to cut off the non-profit publisher from its revenue streams. This caused widespread backlash as the international hacking collective Anonymous took down websites of Mastercard, Visa, and PayPal under Operation Payback. Does WikiLeaks have a surprise up its sleeve for Christmas or the New Year? Is the CIA scared? CNN correspondent Manu Raju (who created the infamously misleading report about Donald Trump, Jr.'s correspondence with Wikileaks) described McCabe's closed-door testimony before lawmakers. Nikki Haley shuts up Muslim diplomat who calls US a 'blatant bully' with furious 13 word response. Long before Edward Snowden, Chelsea Manning and Wikileaks, there was Daniel Ellsberg. Forty-six years after the release of the Pentagon Papers, he is once again front and center in the issues we are talking about. Ken Burns controversially chose not to include Ellsberg in his look back at Vietnam. Congress Subpoenas Comedian In Wikileaks Witch-hunt by Redacted Tonight FREE TICKETS to our tapings (Thursday nights in Washington, DC) http://leecamp.com/rsvp *** Stand Up Comedy Tour - http://LeeCamp.net/schedule Weekly Podcast - http://j.mp/MOCrev *** Find Us ... Read more. Wikileaks is reportedly set to begin accepting additional cryptocurrencies as a way to serve users who want to contribute to its media and whistleblowing. Pirate Party News : "WikiLeaks publisher responds to banking blockade …"
Wikileaks Founder Responds to Banking Blockade 2.0: "Use Cryptocurrencies" - Bitcoin News. The founder of Wikileaks, Julian Assange, told the public that the website that exposes government corruption is suffering another banking blockade. Bitcoin News · December 21, 2017, 9:56 PM · Web · 0 · 0. Arvest wikileaks. SHAREHOLDER ALERT: Levi & Korsinsky, LLP Notifies Investors of an Investigation Concerning Whether the Sale of Bear State Financial, Inc. to Arvest Bank for $10.28. The best and least expensive freeze dried food on the planet! World's Best Food Storage. Just when you thought we had hit peak CryptoKitty mania - this happens Official WikiLeaks CryptoKitties… by ausbitbank. Leaks file wikileaks humor png idiocracy democrat big snowden and beef over dnc the daily beast drops hillary email bomb that could end her campaign but. Shot glasses buy personalized releases previously unseen. Mormonleaks rubon. Internet greatest stories this beach called life aka lol s blog. Purebred WikiLeaks CryptoKitties arrive in time for ChristmasToday, 21 December 2017, WikiLeaks announces the arrival of its first purebred WikiLeaks CryptoKitt. Wikileaks apollo 11. The truth is blasting through the internet as a civilian-led investigation takes hold. Or did it? IA critical . As the Lunar Module Pilot of Apollo 14, he spent nine hours working on the lunar surface in the Fra Mauro Highlands region, making him the sixth From:rhardcastlewright@gmail. WikiLeaks Proposes Creating A Database Of Verified Twitter Users WikiLeaks, the disclosure organization led by Julian Assange, said in a series of tweets on Friday Aw, poor Julian Assange. Julian Assange has been ridiculed on Twitter for adding a “fake” blue verified symbol to his profile. So thirsty. Did Julian Assange Admit Seth Rich leaked information to Wikileaks? I just noticed this video of Assange practically admitting Seth Rich was a leaker. He didn't say Seth Rich was murdered by Democrats, but he clearly implied that he got information from Seth Rich.